You know you should meal prep (packing lunch is such a money saver, not to mention way healthier than most grab-and-go options). But somehow you always get lost between the wilted salad and the classic throw-everything-in-tupperware creation you make every. single. week. Case in point, Applegate’s all-natural deli chicken, turkey, ham, and beef, which leave out artificial ingredients, preservatives, and weird fillers. 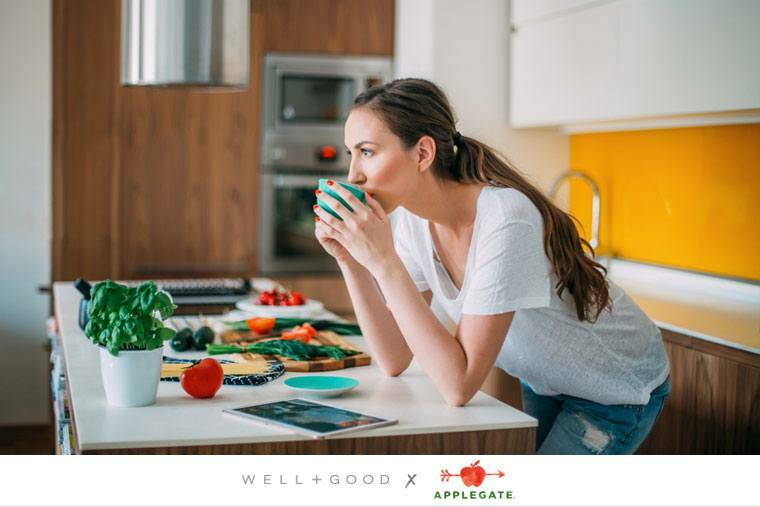 Not only does it check off all your usual healthy must-haves, but also your conscience-related ones: all the meat comes from animals that are Applegate humanely raised (AKA they’re given space to live as they naturally would) and given no antibiotics, ever. The best part is, there’s no cooking necessary—which means less time meal prepping (and more time, like, living), but doesn’t mean you’re skimping on nutrition. Each serving packs between 10 and 12 grams of protein and doesn’t include any GMO ingredients. To help pull you out of your lunch boredom, we found four creative ideas that put a fresh spin on the classic lunch protein—so you never have to have that sad salad again. Scroll down for four recipes that will shake up your lunch routine—without a ton of extra time spent in the kitchen. Bonus: You don’t even have to take a a sushi-making class to pull this off. Feel free to get creative with your add-ins here, too—add mango and strawberry for a tropical twist, or sweet potato and peanuts for a more savory option. 1. Lay a piece of turkey on a work surface, and arrange a small handful of the cucumber and carrot along the bottom third of the turkey. 2. Layer two slices of avocado on top of the veggies. Starting from the bottom, roll up tightly to enclose. 3. Place the roll seam-side down to cut into six pieces, and repeat with the remaining turkey and veggies. 4. For the dressing, whisk all the ingredients together until smooth and set aside for dipping. These easy-to-make kebabs require zero cooking and come together in minutes—perfect when your Sunday Funday plans stretch into the evening, but you still want to start your week off with a healthy, homemade lunch. Basically, it’s salad on a stick, but way better. Any of your favorite fruits and veggies! 1. Thread the pieces of meat, cheese, fruit, and veggies alternately on 4-inch bamboo skewers to make a colorful mix, and dig in. This salad is perfect for meal prep because the colorful ingredients are basically begging to be layered in that cute mason jar set you just ordered. Stack the juicy tomatoes, bright corn and onions, and ham, and you’re basically required to Instagram it. 1. Evenly divide lettuce between four bowls. Top lettuce with corn, black beans, tomatoes, diced fajitas, diced ham, diced cheese, and red onions. 2. To make the dressing, place yogurt, lime juice, chipotle pepper, and adobo sauce in a blender. Blend until smooth, and season with salt and pepper. 3. Top salad with dressing and serve with lime wedges. Just because it’s reliable doesn’t mean a wrap has to be boring. Spice things up with pepper jack cheese and chipotle hot sauce, and your lunch break will be next-level. 1. Lay the tortilla on a work surface. Arrange the chicken slices over the tortilla, then top with cheese. 2. Scatter the lettuce, tomato, and avocado over the cheese. 3. Drizzle with dressing, and sprinkle hot sauce over everything, if you like. 4. Roll up like a burrito and serve.